In that respect, our personal finance management is not distinct either. A number of aspects in our everyday financial matters involving loans, investments, taxes, credit cards, etc. are directed by some definite rules standards. Via this article, let us learn about some prohibitions that is, things we must not do while investing into real estate. If a property is sold within 3 years of purchase, the gain is treated as short term capital gain and there is no tax concession or exemption. If you sell a property after 3 years, it becomes long term capital gain and will be taxed at a lower rate. Even this concessional lower rate, can be withdrawn on long term capital gains from the property if these property transactions are happening too frequently. What fiscal assets do we Indians have? Property, Gold, or big Bank Deposits. That is it. Property prices increase at a much faster rate compared to gold and other financial assets. This belief is one reason why most people end up investing entirely, or corpulent sums in property, in front of which the value of all other investment assets appear to be almost negligible. No. Because of this additional property investment, your money is getting locked. To service this loan, your retirement may get postponed by a few years. 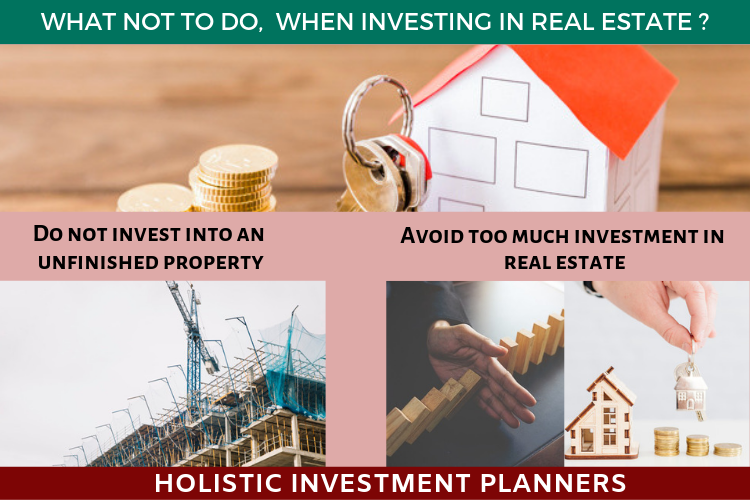 Therefore before taking real estate investment decision it is better to consider your big picture in the form of a comprehensive financial plan. That will hep you take a right investment decision. Previous Previous post: How to influence your partner to save for your optimal retirement dream?